CONCORD, NH – Each spring, many New Hampshire residents see young wildlife by themselves and fear the worst, But wildlife experts warn you may be doing more harm than good. Fish and Game Officials said that unfortunately, well-intentioned, but misguided, individuals see young alone, assume they are abandoned, and take them in to “help” them. Most of the time, they are removing the young from the care of its mother, who was waiting to return. The best chance a young wild animal has to survive is in its natural environment under the care of its mother. If you see a fawn or any other young wildlife and suspect it has been abandoned or orphaned, do not move the animal. Contact NH Fish and Game Dispatch at (603) 271-3361, e-mail [email protected]@nh.gov, or our Wildlife Division at (603) 271-2461, e-mail [email protected] to make a report. Fish and Game staff can assess the situation and help determine the best course of action. In most cases, it is best to leave the young alone and allow time for the mother to return to move it to a different location. Adult deer can be detected easily by predators due to their scent and large size. 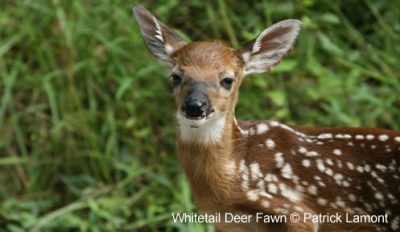 Because of this, does will spend long periods of time away from their fawns to disassociate their scent from the fawn and keep them safe from predators. For the first month of life, the doe will only visit the fawn a few times a day to nurse quickly before leaving again, although usually not going too far. Fish and Game Officials said to never take in wildlife, adding that you could be exposing yourself to rabies, which is a fatal disease. Additionally, picking up any newborn could lead to that animal being euthanized for required testing. Only qualified people with special rehabilitator permits, issued through N.H. Fish and Game, may take in and care for injured or orphaned wildlife. Improper care of injured or orphaned wildlife often leads to their sickness or death. Every year, the state’s only licensed fawn rehabilitator has several fawns die from scours because they have been improperly fed or cared for by the public. Unless you have rehabilitator credentials, it is ILLEGAL to have in your possession or to take from the wild New Hampshire wildlifeand keep it in captivity. For a full list of licensed wildlife rehabilitators, go to www.wildnh.com/wildlife/rehabilitators.html.